An Extra Special River Festival, In More Ways than One! 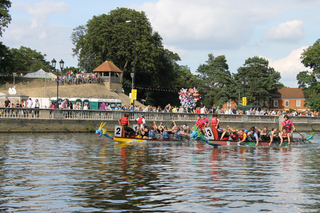 In his column in the final edition of the Bedfordshire Midweek, published this week, Mayor Dave Hodgson has highlighted the reasons why this year's Bedford River Festival will be an extra special event, even by River Festival standards! The Bedford River Festival is a truly unique occasion, and there are several reasons why this year's event on 14th and 15 July is set to be even more special than usual. Firstly, 2018 is the 40th anniversary year of the river festival. It first took place in 1978 to mark the opening of a navigable route from Bedford all the way to The Wash. Even as the event continues to grow, for that reason I believe it's vital that events on the river itself remain a centre piece of the occasion. That's certainly the case this year. We have an array of parades on the river, a river taxi, watersports demonstrations, the unique spectacle of the raft race and much more besides. So wide and varied is the entertainment and activity on the river that it remains the beating heart of the river festival, even as the overall event is set to be the very biggest and best yet. This year we are expanding the footprint to include St Mary's Gardens, to the west of Town Bridge. This is becoming a more and more popular area thanks to the success of the Bedford Riverside development, so it's fitting that it will be part of the River Festival this year with its own stage and lots of activities to enjoy. The River Festival is one of the biggest free festivals in the country, but it retains its character as a community event. This is thanks to sheer numbers of people involved, with so many having some sort of link to the occasion whether it be through the raft race team from the local pub, for example, or the costume being put together for a family member in the carnival parade. Whatever your involvement is, whether taking part or spectating, I hope you have a fantastic Bedford River Festival 2018!